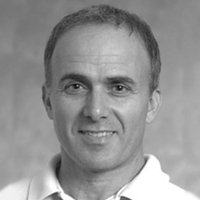 Although mutations affecting critical genes are the major drivers of cancer, tumor cells, especially those starting their journey to full malignancy, depend on growth factors for renewed cycles of proliferation, attraction of blood vessels, as well as for their resistance to chemo- and radiotherapy. Some tumors free themselves from the reliance on growth factors by expressing constitutively active, mutant forms of either the respective receptors or the downstream biochemical pathways. A typical example is provided by the epidermal growth factor (EGF) family. All members of this group avidly bind with a cell surface receptor, called EGFR, the cytoplasmic portion of which harbors an enzymatic activity, namely a tyrosine-specific protein kinase. By simultaneously phosphorylating multiple substrates, EGFR initiates several biochemical and metabolic pathways playing essential roles in tumor progression and colonization of distant organs. Normally, the cellular “ON” state is rapidly downregulated by means of EGF-induced ubiquitination of EGFR and subsequent ubiquitin-dependent sorting of activated receptors to internalization and degradation in lysosomes. However, oncogenic mutant forms of EGFR, such as mutants frequently detected in lung cancer, evade endocytosis or they rapidly recycle back to the plasma membrane. USP9X Controls EGFR Fate by Deubiquitinating the Endocytic Adaptor Eps15. Following activation by its cognate ligand(s), the epidermal growth factor receptor (EGFR) is rapidly routed to the lysosome for degradation in a ubiquitination-dependent fashion. This pathway represents the major mechanism of long-term attenuation of EGFR signaling, and its deregulation is a significant feature in different types of cancers. Here we demonstrate, through a systematic RNAi-based approach, that several deubiquitinating (DUB) enzymes extend or decrease EGFR half-life upon EGF stimulation. We focus on USP9X, whose depletion severely affects EGFR turnover, interfering with its internalization and trafficking. We identify the endocytic protein Eps15 as one of the critical substrates of USP9X, and we map the Eps15 ubiquitination sites. We found that Eps15 monoubiquitination occurs already at minimal dose of EGF stimulation and is essential for EGFR internalization. 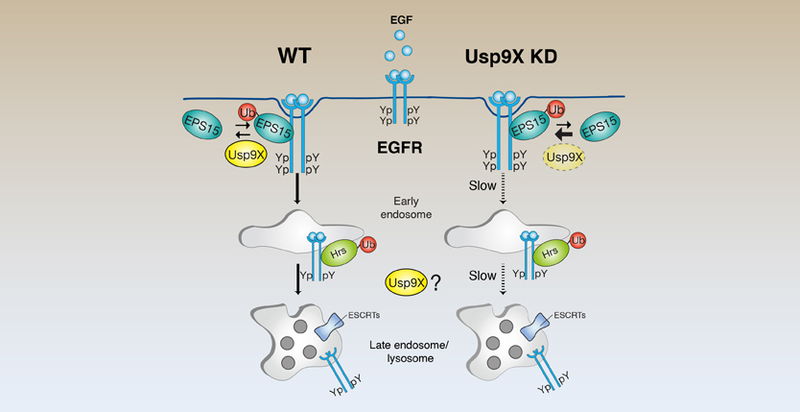 Overall, our findings identify USP9X as a novel regulator of EGFR endocytosis and suggest a model whereby cycles of ubiquitination and deubiquitination events on endocytic accessory proteins may regulate the internalization and trafficking of the EGFR toward the lysosomes. An elegant report published in Current Biology in 2015 by the research team of Dr. Simona Polo sheds new light on the important process that targets EGFR, and possibly additional growth factor receptors, to intracellular degradation. Because covalent tagging of EGFRs with ubiquitin instigates the whole process, CBL, the enzyme in charge of receptor ubiquitination, for example is stealing the limelight from other molecules engaged by EGFRs while en route. Especially interesting are the deubiquitinating enzymes (denoted DUBs), which reverse ubiquitination, and scaffold proteins like HRS, EPS15, EPSIN and STAM, which bind ubiquitin, lipids or membrane coat proteins associated with the endocytic process. What complicates the matter is the observation, originally made in yeast cells, that scaffold ubiquitination, similar to cargo ubiquitination, is necessary for receptor endocytosis, and both entail mono-ubiquitination. To dig deeper into the roles played by cargo and scaffold ubiquitination, Polo and her colleagues employed a library of small RNAs, each blocking expression of one of the approximately 100 DUBs encoded by the human genome. As readout of functional interference, they assayed degradation of EGFRs while using highly sensitive quantitative tests their laboratory previously established. This genome-wide systematic approach permitted identification of a remarkably large group of 18 candidate molecules, including some DUBs previously identified by other teams, all affecting the rate of EGF-induced degradation of EGFR. Although the Polo lab focused on one DUB, USP9X, the other 12 new enzymes they identified will likely open many windows into the main receptor desensitization process and its manipulation in malignancies. For example, by using RNA interference screens, my own group identified in 2012 another DUB, OTUD7/Cezanne-1, as an enzyme that directly deubiquitinates EGFR by forming a physical complex with the receptor and preventing its sorting for intracellular degradation. In line with the ability of OTUD7/Cezanne-1 to augment EGFR signaling, the corresponding gene is amplified in approximately one third of human breast tumors, and high transcript levels predict an aggressive disease course. Unlike OTUD7/Cezanne-1, which modifies cargoes, Simona and her colleagues clearly showed that USP9X affects one or more scaffolds of the endocytic process, primarily EPS15. As befits a non-catalytic scaffold, EPS15 comprises several structural motifs, including two ubiquitin interacting motifs, UIMs. In 2002 Simona reported in Nature that the UIMs of several scaffolds (e.g., EPS15, EPS15R, Epsins and HRS) is responsible for two activities: ubiquitin recognition and monoubiquitination of the scaffold. After clearly establishing that USP9X modifies EPS15 rather than directly EGFR, the team showed that this DUB is nevertheless necessary for rapid internalization and degradation of EGFR, while other receptors tested, for example the transferrin receptor, are not be regulated by the DUB they identified. The availability of new information and reagents able to modify the interaction between USP9X and EPS15, including a mutant form of EPS15 that undergoes no ubiquitination, will surely inspire renewed attempts to resolve the roles played by the coordinated monoubiquitination of both cargo and scaffold molecules. The prevailing dogma assumes that the scaffolds attach to cargo&apos;s ubiquitins, but scaffold monoubiquitination instigates an intramolecular folding responsible for dissociation of the scaffold-cargo complex. Repeated cycles of cargo engagement might underlay sorting of receptors at the plasma membrane and also later, at the early and late endosomes, toward lysosomes. In line with this model, Polo and her team demonstrated that USP9X is involved in EGFR sorting occurring at the plasma membrane, as well as at subsequent, intracellular trafficking stations. Still, their results attribute an interesting role for EPS15 in sustaining the interaction with cargoes, as well as call for re-examination of the current dogma. Highlighting all of the future streams of research opened by the elegant study performed by Simona and colleagues would be quite challenging. One example is provided by the identification, made by another laboratory, of an ubiquitin ligase potentially mediating EPS15 monoubiquitination. The ligase, called Parkin, is one of a few genes mutated in patients with familial Parkinson&apos;s disease, a degenerative disorder of the central nervous system, mainly affecting the motor system. Treatment of cells with EGF stimulates Parkin binding to both EPS15 and the EGFR and promotes ubiquitination of EPS15. Conceivably, the interplay between Parkin and USP9X normally regulates EGFR signaling and protects motor neurons from apoptosis, but this steady state is defective in familial and other forms of Parkinson&apos;s disease, leading to some symptoms of Parkinson's disease. Thus, the 2015 publication from IFOM might provide novel keys to understanding not one but two major diseases, cancer and Parkinson&apos;s disease.